I must admit, I'm a bit of a body wash snob. Not that I won't use drugstore brands -- I'm not completely against them -- but I usually reach for my Philip B., Jaqua or Philosophy shower gels in a pinch. But when I had the opportunity to try Caress Exotic Oil Infusions Moroccan Ultra Rich Cream Body Wash (say that three times fast! 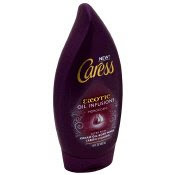 ), I hearkened back to my junior high days when Caress was the only brand I'd consider using in the shower. Do you remember when the brand first started, and their signature body wash came in the peach-colored bottle and just smelled so, so good? It was seriously my go-to shower product for years! Why had I forgotten that, I wondered. Had I become jaded? 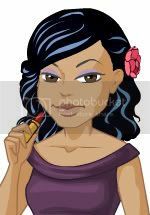 I decided right then and there to hop in the shower and lather up with the creamy goodness that I was sure would come out of the eggplant-colored bottle. And I have to say, I was not left disappointed! The scent is absolutely fantastic -- the blend of cassis and starflower transports you to a faraway exotic island where it feels like anything can happen. And the formula, while honestly a bit creamier than I normally like (meaning I needed to use more on my pouf to get a decent lather), did leave my skin feeling incredibly soft and silky. All in all, it's a definite must-have! Because, let's be honest, who doesn't want to be magically whisked away to Morocco while still in their shower at home? you just came from paris and another trip to morocco! you are touring girlfriend! Ha! The trip to Morocco was only in my shower unfortunately. But it would be great to go there!